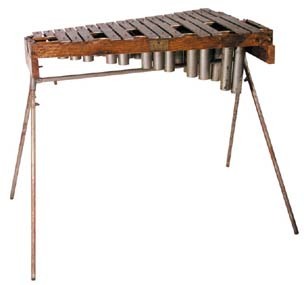 J. C. Deagan, Inc. manufactured their Song BellsAn instrument that consists of tuned metal bars mounted on a rectangular frame, and played with... from 1918-1924. These bells were designed to be used primarily as a solo instrument, but were marketed as an ‘exceptionally fine’ instrument ‘when used in playing an obbligato to a vocal number.’ Hence the name Song Bells. 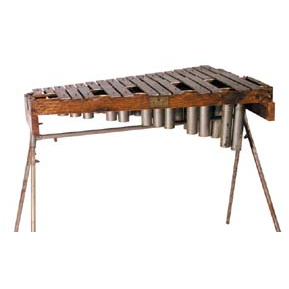 Having tonal characteristics that combined Deagan’s Orchestra Bells, Steel Marimbas, and Celestes, this instrument, Model No. 100, has a 2 1/2-octave range of G4 to C7, which is an octave lower than the standard range for orchestra bells. 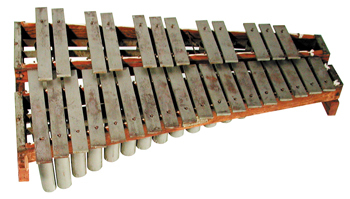 Deagan Song Bells were also available in a model No. 102, which had a 3-octave range of C4 to C7. The bars are 1 1/4 inches wide by 1/4-inch thick, and vary in length from 11 7/16 to 4 15/16 inches. 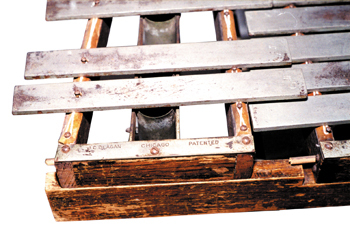 Unlike Orchestra Bells, Deagan Song Bells had resonatorsThe metal pipes that extend below the bars on a marimba, xylophone, or vibraphone. They carry t... for projection.